This cute snowman (and woman!) is a part of my seasons quiet book series. This page is designed to be the left-hand page for my winter spread. The holiday house will be sewn to the right. I’ve left space on the side of the page so I can sew together the binding. 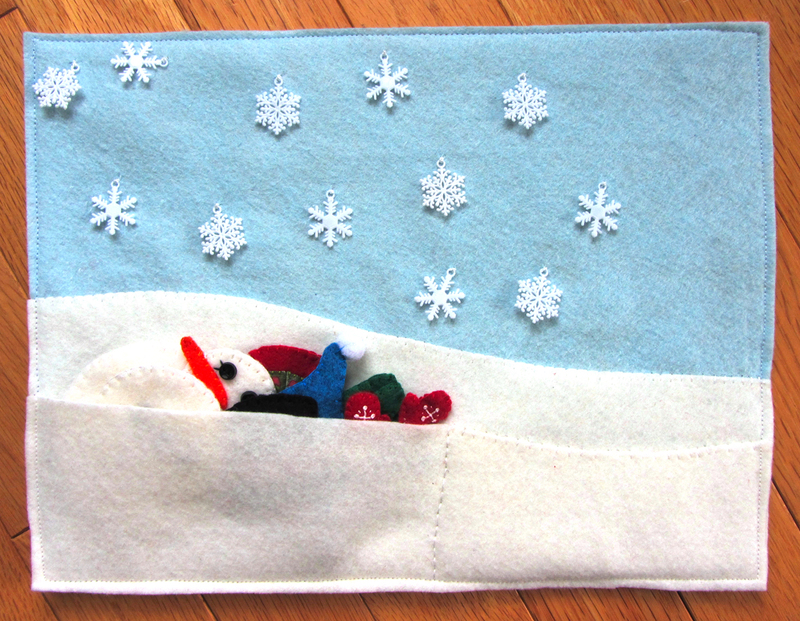 There is a pocket in the snowy hill to store all the parts, plus little snowflakes you can count. 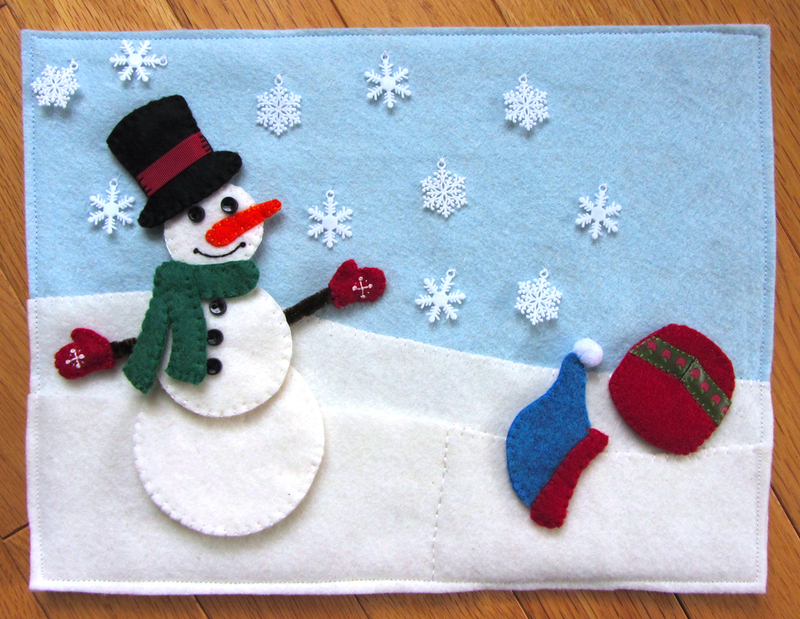 The felt for this page was provided by American Felt and Craft. 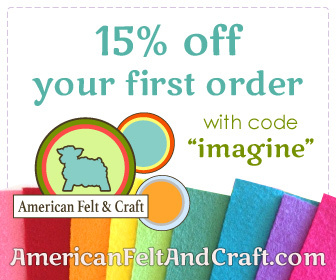 It is their beautiful wool blend felt that is available in about a zillion colors! I chose Christmas colors that matched the holiday house page, but you could easily customize it with your own color choices. Background: I started by cutting out two rows of snowy hills for my blue background. The larger hill was fully sewn down, the smaller one was layered on top and only sewn on the left side. I also sewed a straight line down to make my pocket a little smaller so it would gape. I cut off the strings of the snowflake ornaments and sewed them to the page. If I hadn’t found the ornaments, I would have ordered these buttons . 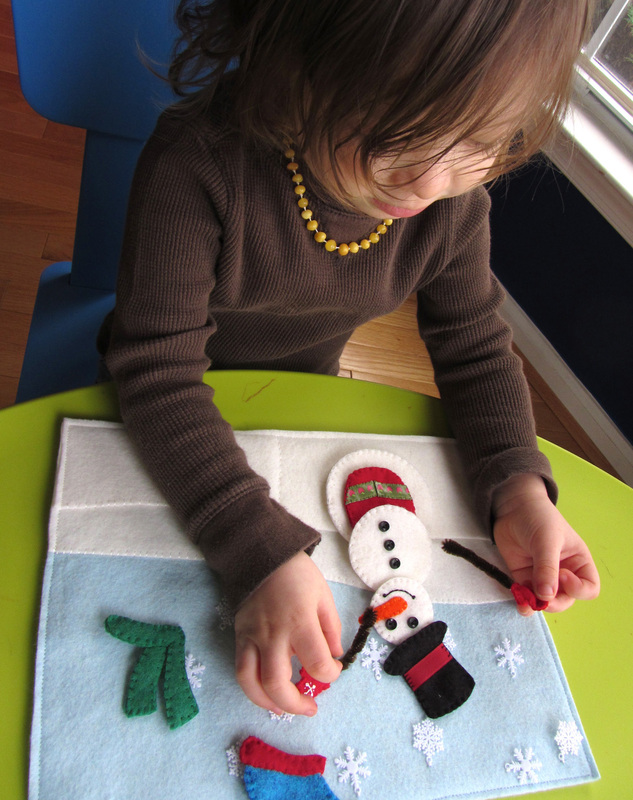 Snowman: I made the snowman/woman double sided to have less loose pieces. If you want more option, you can sew them each as their own pieces. The biggest circle is just two sides sewn together. For the middle circle, I sewed three black buttons on one side, then a curved line of white buttons on the other. Then I sewed the sides together. On the male side of the head circle, I sewed two button eyes, the carrot nose, and a back stitch smile with French knot dimples at each end. For the female side, I positioned the nose pointing the opposite way so both sides line up. 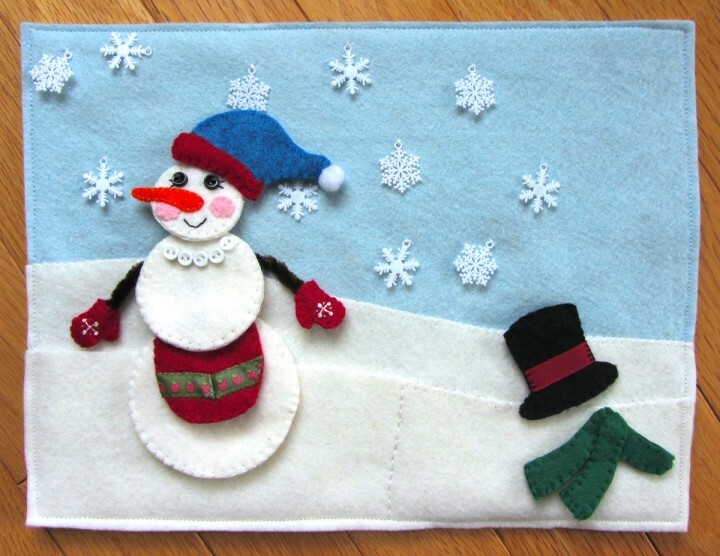 I sewed on two button eyes with little stitched eyelashes, pink cheeks, a back stitch smile and a carrot nose. When both sides were done, I sewed them together. Accessories: For the top hat, I sewed scraps of red ribbon onto each side, then sewed the two sides together. 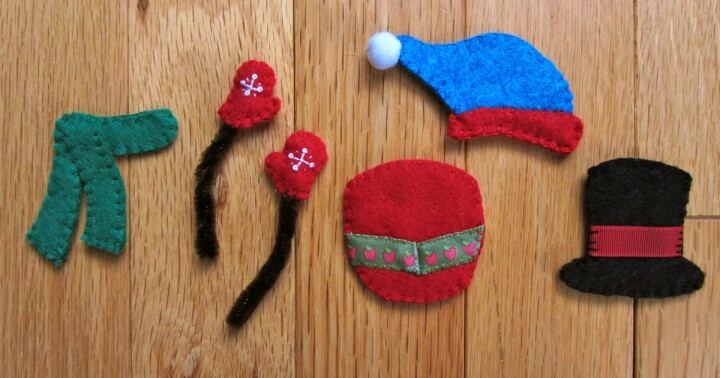 For the stocking hat, I sewed the two blue pieces together, then sewed the red brim pieces on around the bottom of the hat. I ran my needle through the center of a mini pompom and stitched it onto the tip of the hat. I ran the needle through the center again and made a couple more stitches before tying off the thread. The apron had a scrap of ribbon sewn to the front piece before the sides were sewn together. To make an arm, I embroidered a little snowflake onto the mitten front. It is a plus with French knots at the tips and some tiny stitches in between. I cut a piece of brown pipe cleaner twice as long as I needed and folded it in half. I twisted it together, the folded over the sharp tip. I sewed the two sides of the mitten together on the folded-over end of the pipe cleaner, making sure to have some stitches go between the pipe cleaner wires so the mitten couldn’t be pulled off. For the scarf, I sewed the main front and back pieces together. I sewed the front pieces together, then stitched it in place on the front of the scarf. Jax enjoyed building his snowman and has asked me several times to pull it out since I showed it to him. I likes to count the snowflakes, too! His favorite activity is putting the circles in size order – something we are practicing in homeschool right now. If you do this quiet book page, I’d love to see your version! Email me a photo or post it to our Facebook page. This entry was posted in Crafts, Quiet Book, Sewing and tagged Free, Patterns, Quiet Book, Sewing on November 14, 2012 by Stephanie. Hi Anna, you are welcome to link to the site! Email me if you need anything specific. And the train pattern will be up tomorrow! I love your work! You are so creative and clever. All the tiny details are taken care of. Your little one is lucky to have you. Thanks for sharing everything! What are the actual pages made out of? It looks like felt, however on other web sites they use cotton, pellon, muslin, etc. I’m not sure what to buy for the actual background of the page. If they are felt, are they a heavier duty felt than the 9X12 felt sheets at Walmart? If so, what size and what kind? Okay, such a cute page! 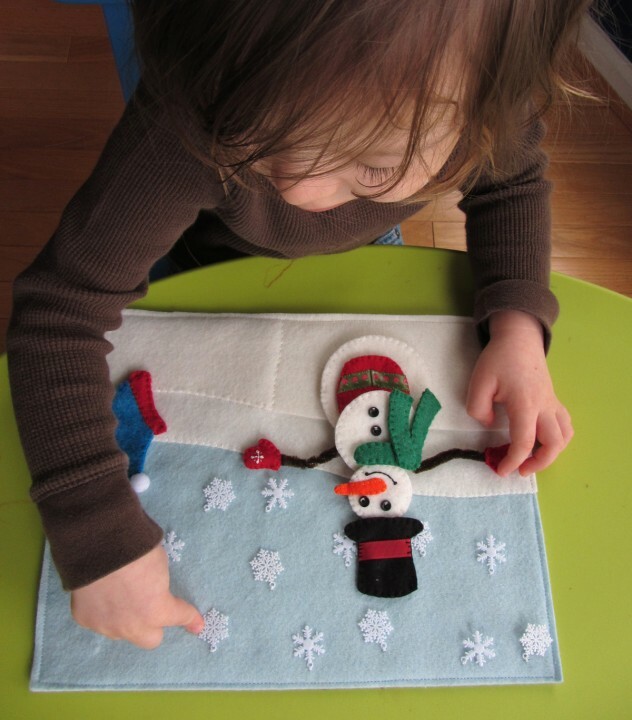 This may be the silliest question you’ve been asked but did you hand stitch the snowman? I love the stitching and would love some direction! How big are the pages of your quiet books? I love, love, love your patterns. They are so easy and quick to follow. I really appreciate that you share them. My nephew (who sits with us in church) will have such a cute quiet book this Christmas! Hi Tami! 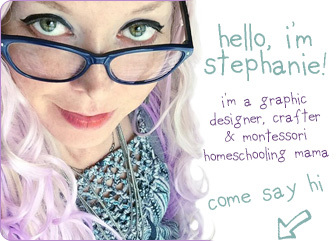 My pages are sewn onto 12″ wide x 9″ high felt sheets, with 2″ of the width sewn into the side binding. So there is about 10″ x 9″ of space for the actual page, but I usually don’t sewn important bits into the inch closest to the binding if it is a 2-page spread. If I make a 9×9 design, I sew it to a full 9×12 sheet and then sew a backing on. If the page is already 9×12 (as my newer designs are), I just sew the backing on. Honestly, You can do whatever you want for the page construction and binding – the key is to be consistant. We love your quiet book pages, they are amazing! We are making one for our little niece and nephew. Just wondering where did you get the cute little snowflakes from. We’re finding it hard to source any nice ones like yours.